Should Mortgage Lending Standards Ease? Policy Makers Face Tough Question: Is Drag on Housing Due Mainly to Tight Standards or Weak Demand? 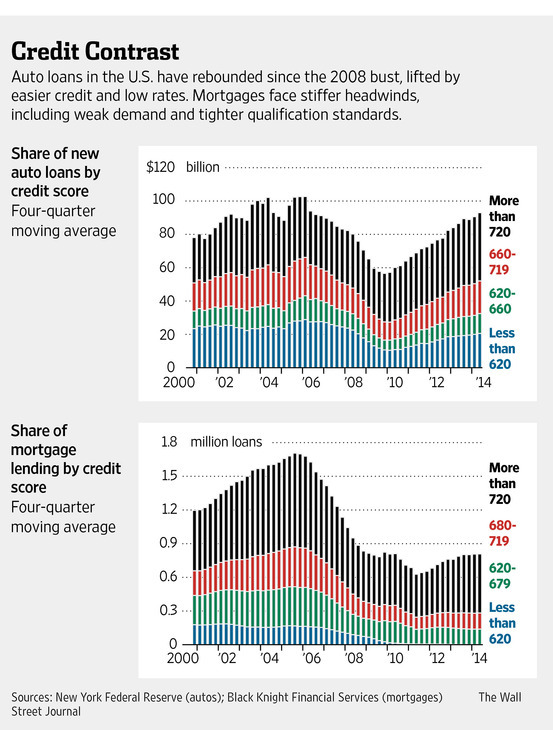 Easy lending standards have helped set postrecession records for new-car sales. New-home building is barely rising, due in part to much tighter standards among mortgage lenders. This disparity underscores the divergent paths the two sectors have taken in the years since the financial crisis. So is it time to loosen up on mortgage lending? The answer is not that simple. Officials at the White House and the Federal Reserve point to tight credit as they flag worries about a soft housing recovery. Fed Chairwoman Janet Yellen last week labeled mortgage-market conditions “abnormally tight.” The same day, the White House met with bank executives to discuss how they might safely ease standards that corrected sharply after the 2008 bust. Easy credit fueled the home-price bubble of the past decade, which spurred overbuilding of homes and boosted consumer spending on everything from cars to college educations. Mortgage investors suffered huge losses after prices collapsed, and private lending markets have struggled to revive. Banks now are sharply limiting their mortgage offerings. Subprime auto lending, by comparison, contracted sharply during the recession but has roared back—at a pace nearly four times that of prime lending over the past four years. Auto lending has rebounded in part because investors didn’t take the drubbing that mortgage investors did. Loans are smaller, cars can be repossessed faster than homes when borrowers default, and the collateral is easier to value. Car sales have also been fueled by an aging fleet that has resulted in pent-up demand. So while car factories may be humming, the housing market’s uneven recovery means the economy isn’t growing at the clip experts hoped it would this year. New apartments are popping up at the fastest pace since 1989 as more young households rent, but single-family home building tends to have bigger knock-on effects for consumer spending and job creation. That’s why fixing thorny issues in mortgage markets has taken on such urgency. White House officials believe improving access to credit is key to reviving not only housing but the broader economy. The hard question for policy makers: Is the drag on housing due mainly to lenders’ conservative postures? Or is the real culprit weak demand because entry-level households have soft incomes, more student debt and little savings for a down payment? “Credit is tight. That said, incomes for a lot of the country are not up,” said Austan Goolsbee, a former chief economic adviser to President Barack Obama. That is a top area of focus for policy makers and lenders. To guard against the risk that they will face unexpected costs if loans default, many banks have adopted standards that go beyond the basic requirements of loan giantsFannie Mae or Freddie Mac and federal loan-insurance agencies. Officials are looking at how to provide more clarity to lenders so they ease up. Other aspects of the tight-credit problem will be harder to fix. Banks face higher costs associated with handling defaulted loans, and as a result, some are choosing to simply make loans to only the best borrowers. Facing new regulations, lenders who once served riskier borrowers remain reluctant to make loans to all but the wealthiest customers. Some of these lenders served borrowers with credit blemishes. Others served those with incomes that are harder to document. The recession has created more of both classes. “The people that are not middle-of-the-fairway borrowers are pretty much shut out today,” said Sean Dobson, chief executive of Amherst Holdings in Austin, Texas. Amherst owns a firm that has bought and rents out 5,000 single-family homes across the country. Many borrowers haven’t recovered fully from the recession. “You need both liquid capital markets and a healthy, financeable borrower base, and we really don’t have either,” said Mr. Dobson. Mr. Stenback says the problem isn’t overly tight credit but rather the lack of income growth. To be sure, any inflexible lending rules only exacerbate the weak-income problem. New data last week show incomes aren’t rising much. They were virtually unchanged from 2012 and 8% below their 2007 levels after adjusting for inflation. The magnitude of the subprime-auto-lending expansion now is much smaller than it was for mortgages leading up to the housing crash. “But something has to give. Income growth needs to improve, or lenders will eventually shut off the credit spigot,” Amir Sufi, an economist at the University of Chicago, said before a Senate panel last week. Ultimately, he said, relying on easier credit won’t sustainably generate economic growth. Easier credit may sound like a recipe for an automatic rerun of the housing crisis. It doesn’t have to be. But lenders and policy makers will have to walk a fine line.